It was sunset when we arrived at the edge of the dunes. We were told that the camels were 10km away and would be 2 hours late. Damn Moroccan transportation system! 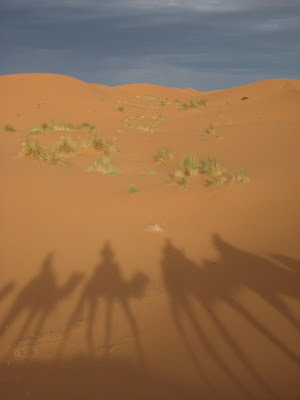 When we got on our camels at 8:30, it was dark and cloudy. Slowly we were led through the dunes in the darkness of night. All that was visible was the silouete of the dunes and all that could be heard was the was the camel's quiet padded footsteps on the sand and their not so quiet digestive systems. Occationally the almost full moon would break through the clouds and bath the desert in an eerie white light. 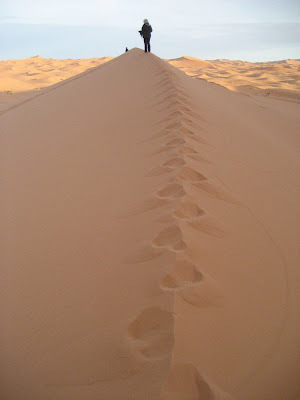 At 10pm, we parked our camels and walked down to four tents that were below some large 250 meter high dunes. Our three nomad guides prepared dinner and our hungry group of 12 dined at 11pm. Afterwords we circled around the fire and sang, danced and drummed until 1am. I tried my luck at the drums until one of the nomad guides told me that I had no rhythm. On the way out here, Moroccans kept on guessing that I was an Arab. Now there was no hiding the fact that I was so very white. I promptly handed back the drums. At 1am the nomads suggested that we go on a hike. We hiked up to the top of the largest dune, layed down in the sand and looked out at the moonlite desert landscape below us that streched into Algeria 40km away. Pure silence as the wind blowing gently past us was all that could be heard. We hiked down and I hung out with the nomads around the fire until 2:30 as they told me Berber jokes. Funny in their unfunniness. 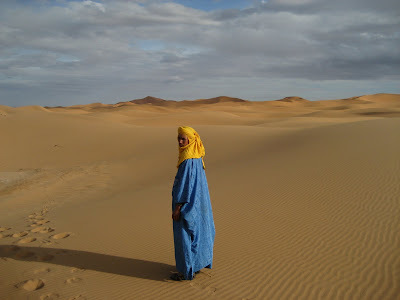 The Sahara desert was an out of this world experience. Those pics look professional. You should sell them, as "investments"!